Peter Taylor chaired the AMSI Education Advisory Committee (EAC) from its inception and was deeply involved in the planning and execution of the seminal workshops on ‘Teacher Content Knowledge and Materials for Schools’. Work in the following years was based on these early initiatives including the first edition of the ICE-EM Mathematics books. Peter guided this work with an awareness of its importance and an ability to encourage others to become involved. 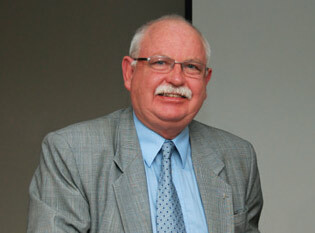 He has overseen AMSI’s response to the Australian Curriculum; the creation of the teacher resource modules; the launch of the “Maths: Make your career count” campaign; the collaboration with CSIRO to produce “Maths by Email”; the support of the “Mathematicians in Schools” program; and of course the new edition of the ICE-EM Mathematics series of textbooks. Peter has given wonderful support to the staff of AMSI and has made a major contribution to each of the projects undertaken during his chairing of the EAC. Peter has been a great friend to AMSI and has supported Garth, Phil and Geoff each in their turn as AMSI Director. Many AMSI staff, particularly Janine McIntosh and Michael Evans, have been fortunate to work with Peter in his time as Chair of the EAC.